In the #86 November/December 2007 issue of Dogs Life magazine we published a story on DIY Doggy Gifts and showed readers how to preserve memories of their pooch and celebrate precious moments through do-it-yourself scrapbooking projects. Expert scrapper Allyson Corbett provided steps on how to create gorgeous mini books and mini albums using pictures of your pooches, and we invited readers to send in photos of their creative work. We have received loads of FABULOUS scrapbooking submissions and would like to thank Dogs Life readers Nicola, Gabrielle, Judy, Chloe and Kathie for their hard work and creativity. 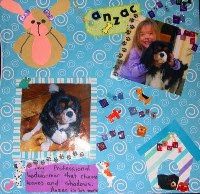 Check out their 'pawtastic' scrapbooking projects here. Wow, I can't believe how beautiful and creative these entries are! Well done everyone - your scrapbooking creations will make your pooch proud!